I seem to have done a lot of book reviews on my blog recently. Today is the turn of A Long Way Down by British author Nick Hornby. 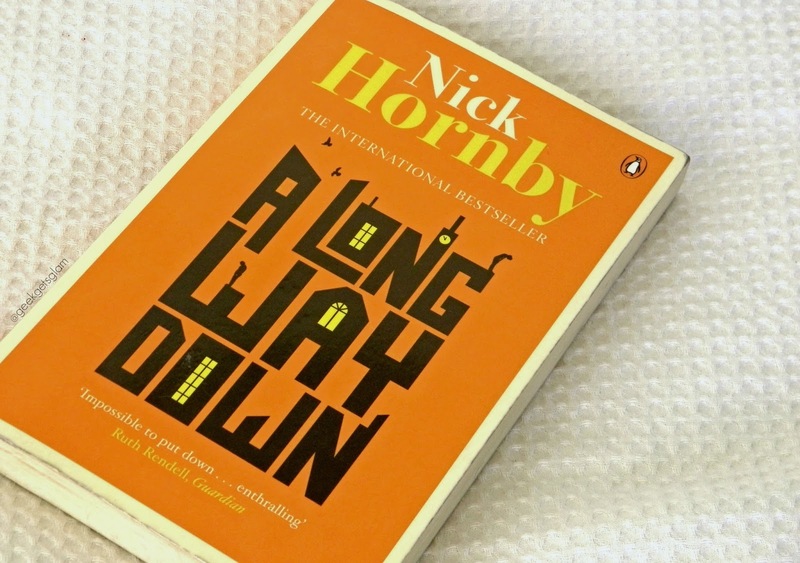 Strangely enough, I studied many Nick Hornby books while I was university as I did a popular fiction module and I quite enjoyed the way Hornby writes. His books all have this typical British sense of humour and he is brilliant at capturing the characters' voice, which is vital when writing a book like A Long Way Down. A Long Way Down is about four people who meet when they all try to commit suicide. Despite it's rather macabre plot, the book is comical and light hearted, whilst still touching on the sensitive topics, such as mental health, loneliness, disability and of course suicidal thoughts, in a respectful way. It's an interesting read. The storyline follows the protagonists, Maureen, JJ, Jess and Martin, as they interrupt each other trying to commit suicide by jumping off a building. It's not really a laughing matter but somehow Hornby makes the situation funny by introducing the reader to such extreme personalities, like TV personality Martin and ex-rock star JJ, and forcing these people to form a sort of 'gang' of support for each other, until February 14th when they will try suicide again. I loved having the split narrative. As each character had their individual personality, it was a nice touch to read how each one's perspective differed in the same scenarios they faced together. It is a good insight into how perspective can alter the way we look at things in real life, and how there is always more than one version of the story! It helped the story flow smoothly too as each voice pushed the story along in a different way. Maureen's narrative is quite sad and easy to empathise with, whereas Jess' narrative is annoying and bratish, but somehow I felt really sorry for her as I was reading. I tend to find myself initially hating most of the characters that Hornby creates, and this book was no exception. I only particularly liked Maureen, who arguably has the most 'genuine' reason for wanting to end her life, albeit a bit of a selfish reason. The other three main characters are the most annoying and pretentious idiots you will ever come across. The thing that kept me reading was the relationships that formed between the four main characters, and how their characters developed throughout the plot. The book was quite short but it suited the story. I don't think I could have tolerated the characters much longer to be honest! But, having said that, I did grow fond of them all and it's their stories that make this book such a fascinating read. Suicide bringing people together, and ultimately forming a support unit, is such an interesting concept to explore and Hornby takes us through the highs and the lows of this throughout A Long Way Down. If you're after a darkly comical read, give this one a go.